Kitchen closes at 11:00pm every night. American Social's largest restaurant is comprised of over 15,000 sq ft of waterfront property with four full-service bars, a raw bar, and an intimate dining room with an indoor and outdoor VIP bar and patio space for private events up to 40. The patriotic property brims with lively nightlife and happy hours where friends come together and good memories are made. Enjoying a good meal near downtown Tampa shouldn’t empty your wallet, so American Social Bar & Kitchen offers a massive variety of daily specials. You’ll be able to score a great deal every day of the week at AmSo! On Monday, we feature delicious burgers for only $5. In addition, enjoy $10 Pizzas and 50% off select glasses and bottles of wine every Wednesday. With deals like these, you’ll gladly become an AmSo regular. American Social Bar & Kitchen has Tampa’s best sports bar happy hour specials, so come prepared to eat and drink like a king. Select craft beer, wine, and liquor is 50 percent off, and you can enjoy $6 shared plates. Stop by AmSo from 4 to 7 p.m. Monday through Friday and kick back and relax with delicious food, ice cold drinks and great people. AmSo’s popularity in Miami and Fort Lauderdale is due in no small measure to the fantastic events we host throughout the year. As we work hard to become your favorite venue in Tampa, you can count on us to host holiday parties, sporting event viewing parties and other special events that are sure to impress within our 2,500-square-foot private event space. Find us at 601 S Harbour Island Blvd Suite 107, Tampa, FL 33602. There’s always something exciting happening at American Social, and you won’t want to miss any of it. At AmSo, you’ll have a blast with old friends while meeting brand-new ones, all at the same time. Keep an eye on our events calendar to be sure you’ll be ready to join in on all the fun throughout the month. 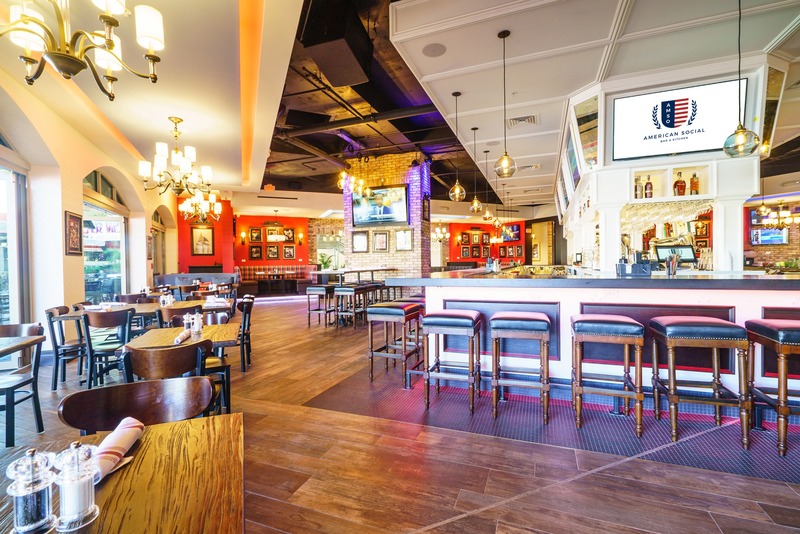 American Social Bar & Kitchen is more than just a simple sports bar or restaurant in Tampa, FL; we are a place where friends, family and business partners can relax and enjoy spending time together in our 15,000-square-foot restaurant at Pointe on Harbour Island. The vision of two college friends, AmSo’s philosophies are rooted in tradition, while our eyes are focused on the future and becoming the best restaurant and sports bar around. We offer All-American comfort food that goes perfectly with the finest selection of craft beers to be found in town. From open to close, the team at AmSo’s restaurant on the water in Tampa will create a comfortable place for you and your party to rest and relax. In our opinion, brunch is as close to perfect as a meal can get. 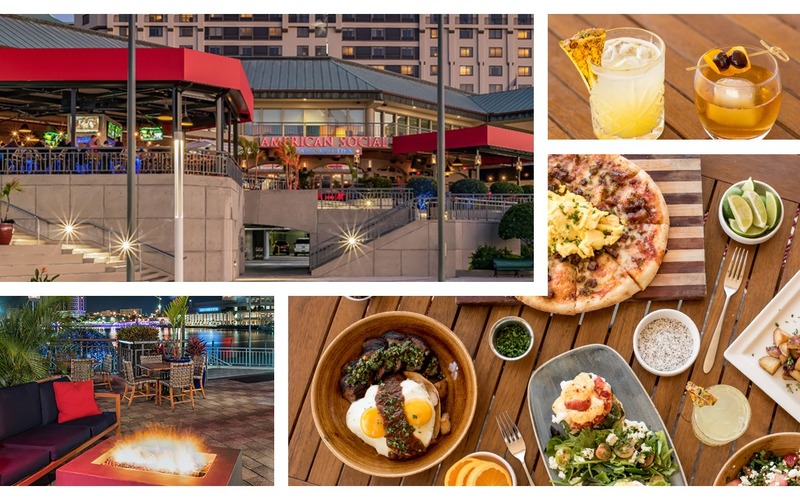 Whether you’re craving a restaurant with sweet breakfast favorites or ready to chow down on a burger and fries, you can have the best of both worlds at American Social Bar & Kitchen. Get your weekend started right by sleeping in for a few extra hours and then head to the AmSo near you for our unbeatable brunch! If you’re stopping into American Social Bar & Kitchen for a quick weekday bite on your lunch break, check out our In and Out Lunch Special Menu, where you can get a classic American lunch with dessert included. If you have more time to spend with us, browse our delicious selection of dishes, including unique shared plates you can split with your group. Whether you’re getting together with friends to watch the game or setting up an intimate one-on-one date, American Social Bar & Kitchen in Tampa has the perfect dinner menu to make it a delicious occasion. Enjoy the unique atmosphere, extensive drink list and excellent food that American Social has to offer. Of course, all that food is bound to make you thirsty. To help sate your thirst, our menu is full of some of the finest craft beers this side of the Mason-Dixon line. Whether you crave an IPA or a stout, a lager or a strong cider, we will be happy to help you pair the perfect drink with your meal.